← Expanding our produce storage? As of Saturday afternoon, we have a bicycle trailer-size space in our garage. After about six weeks on Craigslist (felt like longer! ), with me questioning all along rather I really wanted to sell it, Sir’s Chariot found a new home. Given that we’ve probably used the trailer to transport Gabriel all of ten times in the two-and-a-half years we’ve owned it, letting it go was certainly the logical thing to do. But of course there was that little voice saying, “What if you need it?” Once you have something, it’s much easier to default to keeping it, just in case. That, and the fact that the trailer was a really exciting purchase — a great product for a great price (we got a very good condition, high end trailer for about 1/3 retail value) — and the culmination of months of searching CL, for the item that would allow me to use my preferred form of transportation, with an infant (at the time, I did not know about the wonder of front-mount infant seats). Ironically, as hard as it was to find a used Chariot (now Thule Chariot) trailer in the fall of 2011, by the time I decided to put the trailer on CL this spring, they were everywhere. It both made me despair of ever selling ours, and feel a bit better about the decision to sell, knowing that if, for some reason, we decided we really wanted a child trailer again, we might have an easier time finding one. 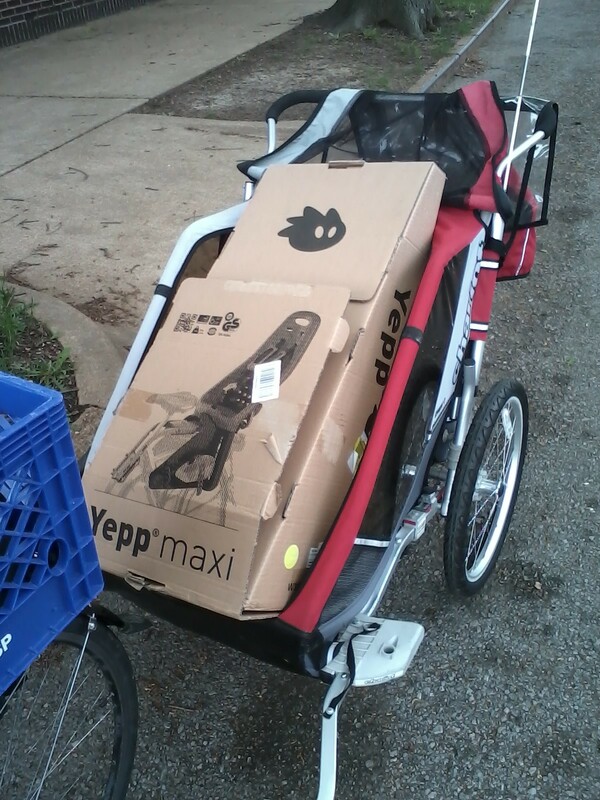 The sale/cleaning also included the Yepp Maxi standard rear seat that I bought in error (we needed the Yepp Maxi Easyfit for the Edgerunner). We debated keeping the standard seat as well, as a back-up child transport option, but instead we have a plan in the works to retrofit one of our existing bikes to work with the Easyfit seat (more on that later). I’m also planning on making a rain/weather cover for the Yepp seat (having something to keep Sir dry was one of the main arguments in favor of keeping the trailer). 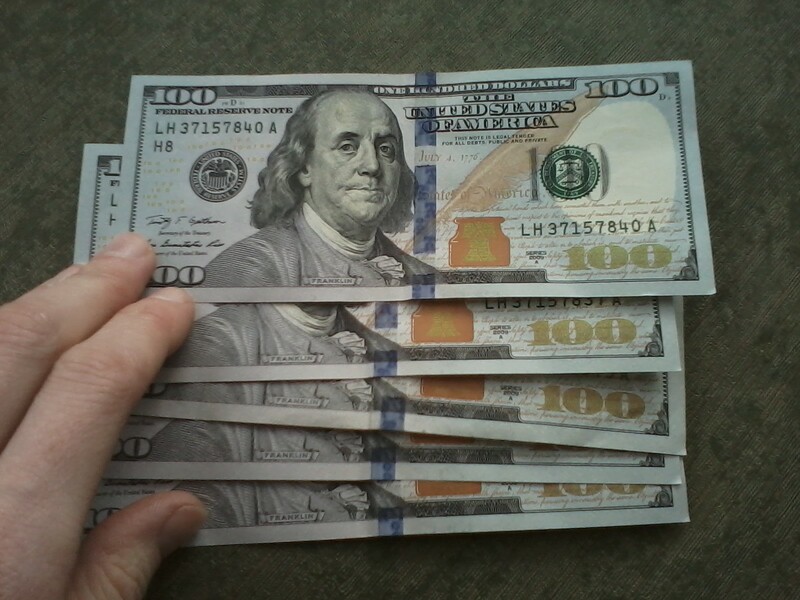 Of course, since I don’t walk around carrying c-notes, I had, in fact, not seen the “new” hundreds (actually dated 2009), and I was more than a bit wary. I’m pretty sure they’re legit, but I wrote down the guy’s license plate number, just in case (he seemed like a nice guy, but you never know). In the end, the hardest part was negotiating a price with the buyer (done by email and text before we ever met), when all along I had the little voice questioning the decision to sell in the first place. Twenty-four hours post-sale, I’m feeling rather good about the decision, which is a good sign. No seller’s remorse, so far. Given the recent [temporary] addition of the refrigerator, garage space is still going to be tight when we bring the Edgerunner home this week (! ), but having the trailer gone will certainly help! This entry was posted in Biking, My Life and tagged biking with baby, biking with kids. Bookmark the permalink. The new bills sorta look like Monopoly money to me. Congrats on taking the leap to sell the trailer. My garage is in need of some SERIOUS spring cleaning too. And alas, I fear my junk is of the ultra-junky variety… so much so that I’ll feel lucky if I can find someone to take it off my hands for free! Yes, there is still more cleaning and de-stuffing to do, in both the garage and the basement, but this was a good step. I think the fridge might be better after my cleaning attempt, but, if not, we may be trying to find someone to take that off our hands for free! I can’t really imagine how this would work for a fridge, but when I’ve gotten horrible stinky fish-oil on my hands (from squirting it on my cats’ food) the ONLY thing that works to get rid of the odor is to rub my hands in coffee grounds – apparently they do a really good job of absorbing odors. Hi there I just whant to know if you had sell the yepp seat ..I been looking for one used in good condition ..I am in the USA ..lol yea that money looks fake but is not is the new 100 dollar bill..